Beltex met a solid traded selling to a top of 2,500gns in Welshpool on Thursday 1 September at the Wales and Border Beltex Club’s Welsh Premier show and sale. Sale topper at 2,500gns was a three year old ram consigned by Messrs Jones & Roberts (Adrian Roberts), Penparc Farm, Llangynin, St Clears. 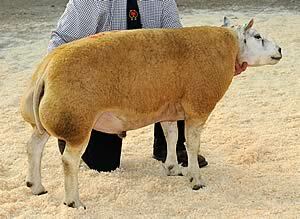 The ram, Glantre Mickey was bred by Michael Owens, Pontsian, Llandysul and was purchased by Neil Marston, Cockermouth, Cumbria. A strong run of Glantre bred rams from Michael Owens were among the money later in the day when a shearling by Airyolland Loyalty led the section at 1,400gns to the Pennie family, Glyn, Chris and Nigel, Llandyssil, Montgomery who also paid 1,280gns for the shearling ram, Southern Acres Prince of Wales, a Southern Acres Moonraker son from L and SE Hewitt, Pennyfford, Wrexham. Next from the Glantre pen was Glantre Panther, another shearling ram this time by Aviemore Nadal which sold for 1,080gns to GJ Hughes and Son, Llandrindod Wells followed by Dunevly House Jeronimo sired sons, selling for 1,050gns to H and B Powell, Rhayader, while two lots shared a 1,000gns price tag; the first went to DR Owen and Sons, Tywyn, Gwynedd, while the second 1,000gns entry Glantre Pavaroti was secured by DJ Lloyd, Caersws. The Glantre pen of 17 averaged £880.14. Bob Blandford, Eastnor, Ledbury went to 1,050gns for the pre-sale show champion, Wern Pacific, a shearling ram by Ardstewart Charles from Gwion Morgan, Corwen. Mr Morgan headed the ram lamb trade at 720gns with Wern Rambo, a Van’t Ophoverveld King Kong son and out of a Brickrow bred dam to Y Edwards, Carmarthen for her Penbryn Parc flock. Gwion Morgan also led the female section at 950gns with Wern Penny, a shearling by Wern Memphis and out of a Brickrow dam. The buyer was H Williams, Llanddeusant, Llangadog who also went to 800gns for another Wern shearling ewe, this time Wern Peaches, by Clary King-Pin. Sharing an 800gns bid was Cennen Pearl, a shearling ewe by Cleeview from GJ and RA Williams, Gwynfe, Llangadog to RW Hudson, Bumstree, Nottingham. 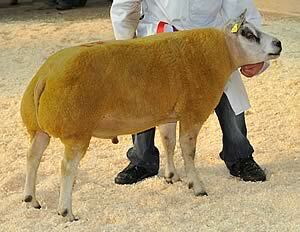 Averages: Rams: 3 aged £1,382.50; 76 yearlings £621.57; 24 lambs £296.16. Ewes: 21 yearlings £484.50; 4 lambs £267.75.